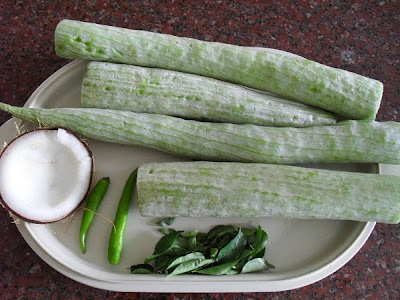 Podalangai (snake gourd) pachadi is an oft prepared dish in our house. The tender green colour and the juicy soft crunch of the vegetable lends a special taste to the pachadi. 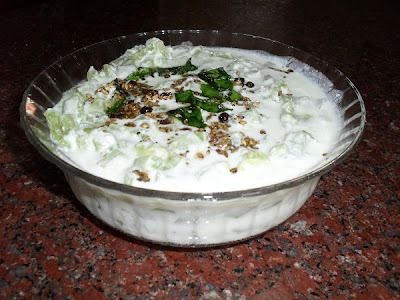 We love to relish this pachadi with vattal kuzhambu and rice. 1. Wash and chop the snakegourd along with its tender seeds into small uniform pieces. 2. 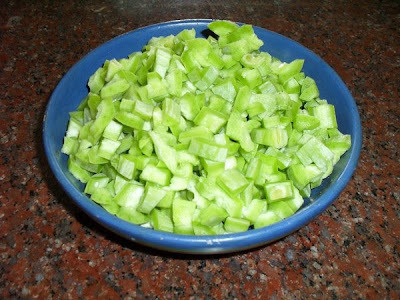 Boil the chopped snakegourd in just enough water with 1/2 a pinch of salt till it is cooked but not mushy. 3. Drain the vegetable and set it aside to cool. Save the drained water to be used in other dishes. 4. Grind coconut gratings and green chillies into a smooth paste adding a little water. 5. 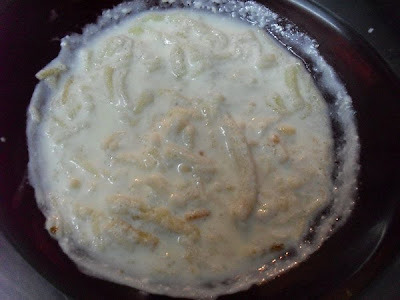 Blend the paste, 1/2 a pinch of salt and the thick curds together and mix into the cooked and cooled snake gourd. 6. Heat coconut oil and add the whole black pepper. 7. When the pepper cracks add cumin seeds and switch off flame. 8. Add curry leaves into the seasoning and pour over the Podalangai Pachadi. Relish the aroma of the seasoning and the luscious pachadi with any 'variety rice' you like. 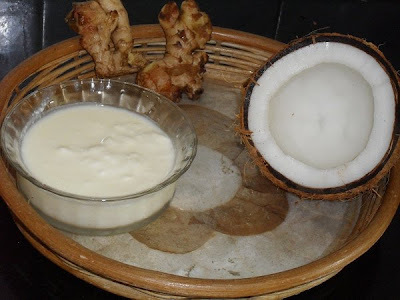 Inji Tengai Thair Pachadi (ginger and coconut pachadi) can be termed as a double dish because it can also be used as a chutney depending on the requirement. One spoon of this pachadi with one spoon of hot steaming rice at the beginning of a meal ensures good appetite. It goes very well as a side dish with pongal, pulav, dosas and adais. 1. Add little water and smoothly grind coconut gratings, ginger and salt into a thick paste. 2. Blend the paste into the curds. 3. Heat oil and add mustard seeds. 4. When the mustard seeds splutter add the seasoning to the pachadi. 5. Garnish with fresh coriander leaves. 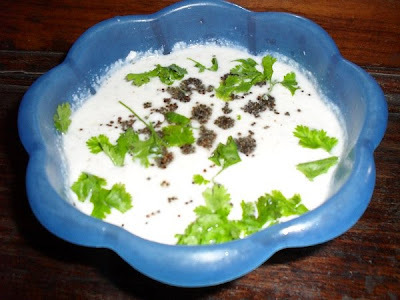 Enjoy the cool Inji thair pachadi and its appetizing aroma. Thair pachadi is a cooling side dish relished along with a wholesome south Indian meal. The basic ingredient is of course 'thair' - curd - which is thick, fresh and not sour. When a vegetable, fruit, nut , herb or a savoury is added to the curd and garnished or seasoned with spices it transforms into a delicious thair pachadi. Cucumber (vellarikai) thair pachadi effortlessly fits into any menu plan and is most commonly included in our every day cooking. With a little more thinking and a little more effort many other interesting thair pachadis can be prepared. 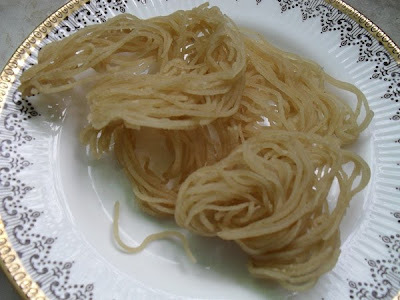 Vadams or Vadagams in Tamil also known as Sandige in Kannada are rice wafers or crispies prepared with rice flour during the summer months. out under the sun. Once the vadams are dry they are stored in air tight containers. These vadams are deep fried and savoured like chips. 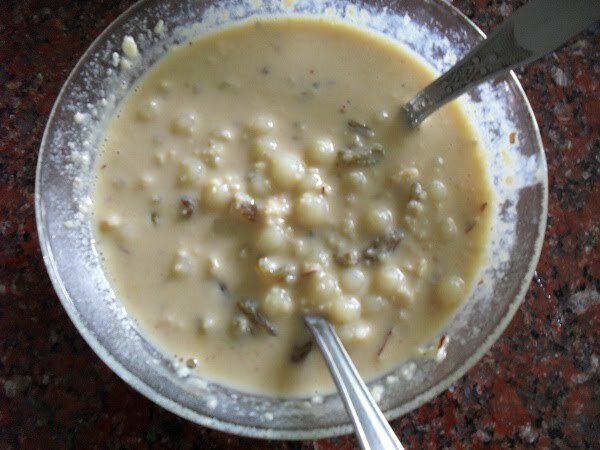 My mother's easy to prepare vadam thair pachadi is considered a delicacy among family members and we love to prepare it on special occasions. 1. Heat oil in a kadai and drop two vadams at a time. 2. When the vadam puffs up ( usually two or even three times its size), remove with a perforated ladle and drain on a paper towel. 3. Ten minutes before serving arrange the vadams in a single layer in a shallow bowl and slightly crumble them with the back of a ladle. 4. Beat and pour the thick curd over the vadams and let them soak for ten minutes before you serve. No salt or other spices are necessary as the vadams already contain them. Enjoy the flavoursome vadam thair pachadi with any meal. This year my daughter, Dibs, has joined me to celebrate all the festivals at our place after so many years. 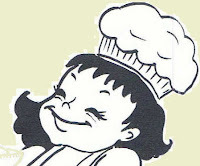 She is a great cook and enjoys trying out recipes and we discuss a lot before publishing a new post. Ganesha Chaturthi is almost round the corner, and I intended to prepare the traditional Pal Kozhukattai as an offering to the Lord. 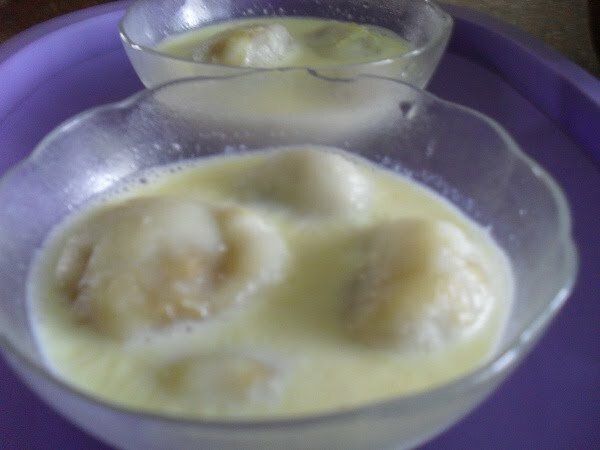 My daughter had mentioned to me about a Bengali sweet called Dudh Puli Pithe, which reminded me very much of Pal Kozhukattai. Today I prepared some traditional Pal Kozhukattais, and also some with a Bengali touch for a dry run, and it turned out to be very delicious. 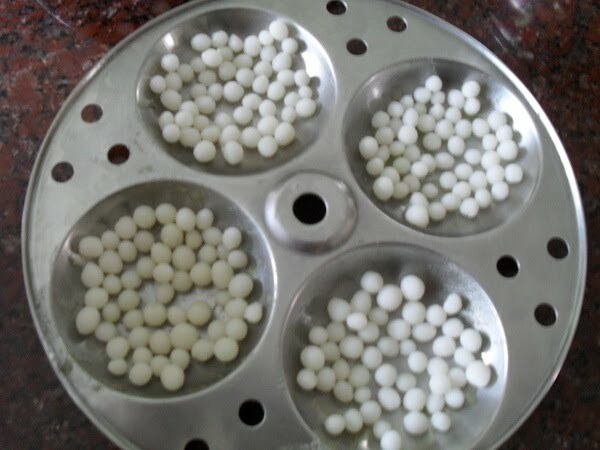 Traditional Pal kozukattais are simple cooked rice flour beads, in milk. With the ingredients below, I made both varieties! 1. 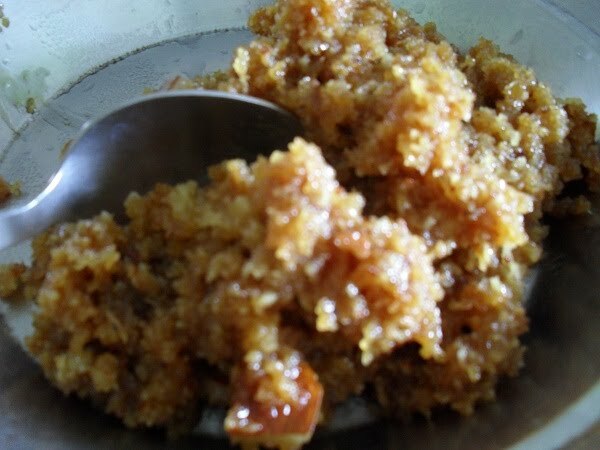 Melt jaggery in a cup of warm water and filter it. 2. Mix the coconut and jaggery and cook in a thick bottomed vessel, till it becomes a lump and starts leaving the sides of the thick vessel. 3. A pinch of cardamom powder can be added to the above 'Poornam' if desired. I like to retain the authentic flavour of coconut and jaggery without the addition of any flavouring. 4. Boil 1 glass of water with a pinch of salt and a tsp of oil in a heavy vessel. 5. Slowly add rice flour to the boiling water, stirring all the time. 6. 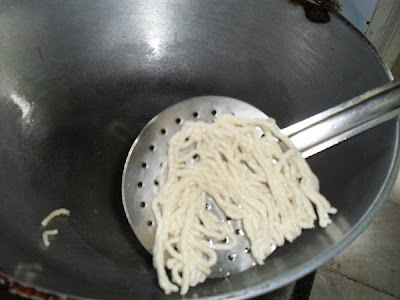 Cook the rice flour till all water is absorbed; switch off flame and cover with a lid. 7. Boil milk till it reduces to 3/4th the original volume. 8. Make a paste with 1 tbsp rice flour and water and stir into the milk and boil for few more minutes.This will prevent the milk from curdling while adding sugar. 9. Add sugar, cook for few more minutes; add cardamom powder and switch off flame. 10. 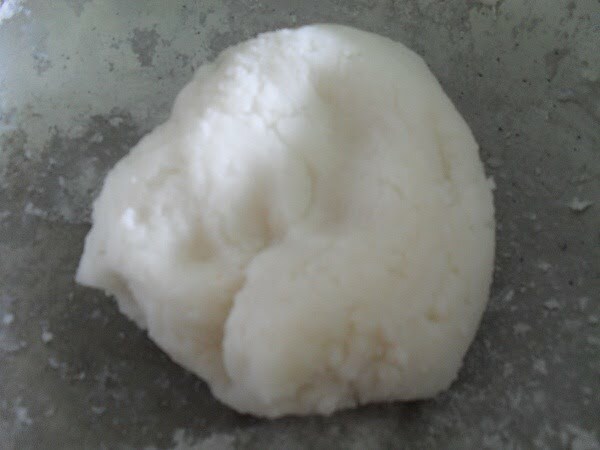 Knead the cooked rice flour into a smooth dough. 11. 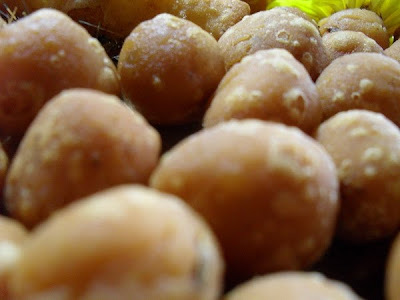 Take out a small portion and roll into very small bead sized balls and keep aside.This is for the traditional pal kozhukattais. 12. From the main portion, pinch out a plum size of dough, knead once again and make into a cup, coating yours fingers with oil so that the dough does not stick to your fingers. 13. 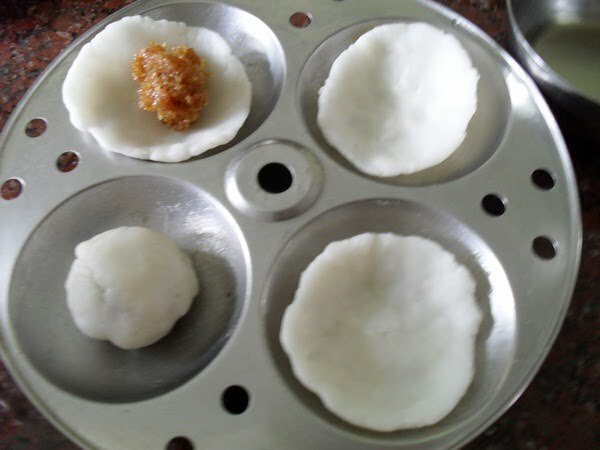 Place a teaspoon of 'poornam' in the dough cup and gather the edges together sealing the poornam inside the shell. 14. Flatten and press the gathered point and shape the kozhukattais into poornam filled flat balls. 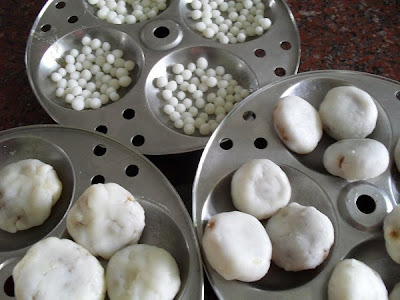 For the given measure you can get a cup of beads, and 21 poornam filled kozhukattais can be prepared. 15. Steam the traditional kozhukattais as well as the poornam filed kozhukattais in the pressure cooker for ten minutes, and allow them to cool down. 1. Remove one cup of the prepared milk in another vessel and bring to a boil. 2. Gently add steamed dough beads and raisins to the milk and boil for a few more minutes. I just added one tablespoon of the left over 'poornam' to the milk for this preparation, which enriched the flavour. 1. Bring the prepared milk to a boil and reduce flame. 2. Gently add the steamed Poorna Kozhukattais to the milk and simmer for two minutes. 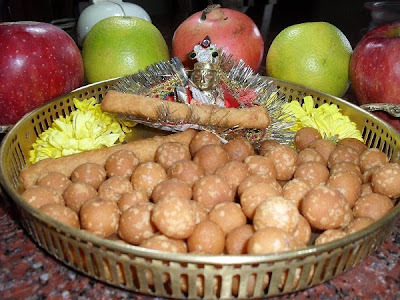 Offer both the sweet dishes to Lord Ganesha and indulge in the prasadam! Sheedai is easy to prepare and is an interesting nibbler's delight, which is mostly remembered only during Sri Krishna Jayanthi. This is the day to celebrate the birth of Lord Sri Krishna, when sweets and savouries relished by babies and children are prepared as offerings to the divine baby . It is customary for the professional cooks to pray and perform a short pooja to the hearth, stove or choola before commencing to prepare a feast.This is supposed to be an assurance for a good feast and protection against any probable fire hazards or accidents. 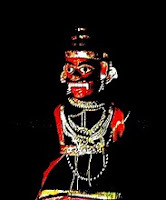 Like wise special care is observed while preparing Murukkus and Sheedais because they have a tendency to erupt and burst like crackers once they touch hot oil, splashing the same on the cook's face. A small quantity of dough is shaped like a cone which represents Lord Ganesha, the Remover of Obstacles and the Sheedai Pillaiyar is fried with a prayer before the whole lot of Sheedais are fried. 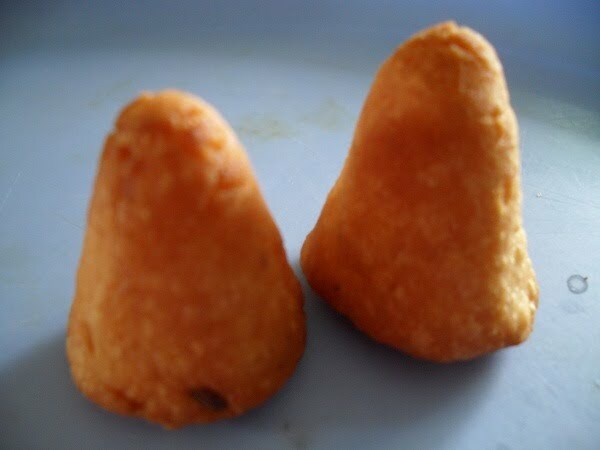 Grand mothers love to make 'Cheepees' out of the dough for their adorable baby Krishna. 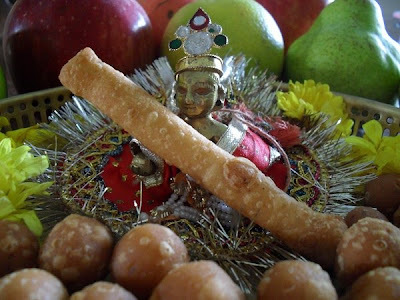 The Sheedai dough is shaped like popsicles or bread sticks and fried and offered to the Lord and then given to the babies in the house. 1. Dry roast black gram dal till the colour changes into red and lets out a pleasant aroma. 2. Cool the dal and grind to a very fine flour. 3. Mix all ingredients rubbing the butter thoroughly into the flour mixture. 4. Add water little by little and knead well till a stiff soft dough is formed. 5. Cover the dough and let it stand for 15 minutes. 6. 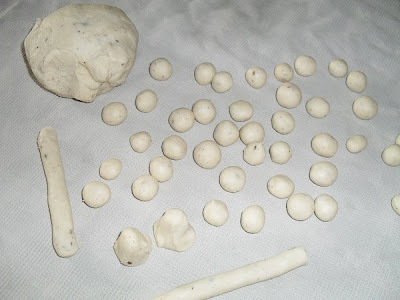 Pinch small marble sized dough and shape like marbles. 7. Make all the Sheedais and leave them to dry on a kitchen towel for another 15 minutes. 8. Heat oil and drop about 20 Sheedais into it and lower the flame. 9. Cook until they become golden in colour turning them now and then with a perforated ladle. 10. Drain on a paper towel when done, increase flame and drop in the next batch. Enjoy nibbling the Sheedais whenever you have the craving.